ILLS, in conjunction with CIDRAL, is pleased to welcome Professor Dieter Stein (Heinrich-Heine-Universität Düsseldorf) to Manchester. 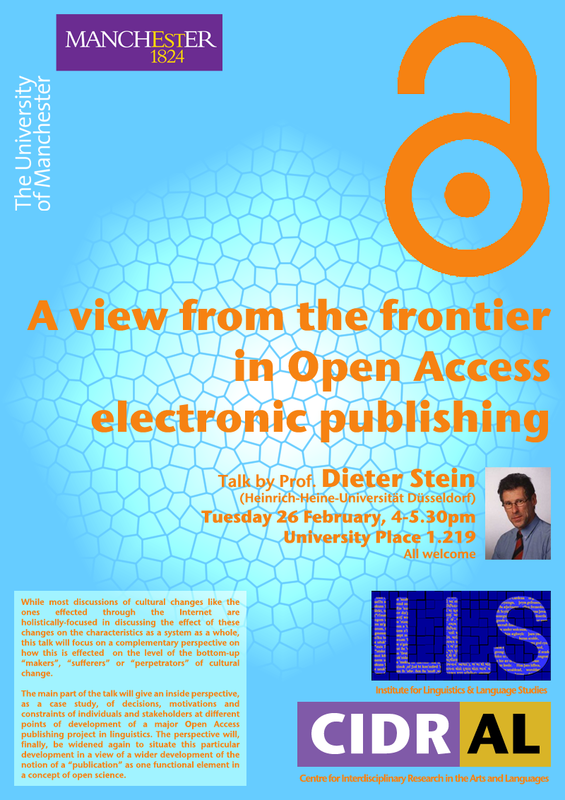 Prof. Stein will be giving a talk entitled “A view from the frontier in Open Access electronic publishing”, on Tuesday 26 February from 4pm to 5.30pm, in University Place 1.219. All are welcome. The talk will be of relevance to anyone who has anything to do with academic publishing, and will include a case study of the development of the eLanguage digital publishing platform for linguistics, in which Prof. Stein played a major role. While most discussions of cultural changes like the ones effected through the Internet are holistically-focused in discussing the effect of these changes on the characteristics as a system as a whole, this talk will focus on a complementary perspective on how this is effected on the level of the bottom-up “makers”, “sufferers” or “perpetrators” of cultural change. The main part of the talk will give an inside perspective, as a case study, of decisions, motivations and constraints of individuals and stakeholders at different points of development of a major Open Access publishing project in linguistics. The perspective will, finally, be widened again to situate this particular development in a view of a wider development of the notion of a “publication” as one functional element in a concept of open science. If you have any questions, please contact George Walkden (whose email address is what you’d expect at manchester.ac.uk). And please feel free to circulate the below e-flyer!